360 Arts has already earned a nationwide reputation as a first-class, award-winning, part-time performing arts school and management agency for students from a diverse range of cultural backgrounds. The north-west London institution started in September 2013, then relaunched in September 2017, with Carol as principal and managing director. In January 2018, she approached Tilly Kamara to become the agency director of 360 Arts Management. The agency was relaunched and has gone from strength to strength. In March 2019, the school expanded, and 360 Arts now operates weekend classes offering triple-threat training in two different locations – in Hendon on Sundays and Dollis Hill on Saturdays. We specialise in nurturing and representing performers from all cultural backgrounds. We build their confidence, and help them find themselves within themselves. 360 Arts is a home away from home where everybody belongs. In Hendon, 360 Arts takes over the ground floor of Middlesex University’s Vine Building every Sunday, and runs classes in singing, dancing and acting for students aged five and above. Those aged five and six are part of 360 Arts’ Star Turns programme and receive 75 minutes of combined training. Those aged seven and above are split into four age groups – seven to nine, 10-11, 12-13, and 14-plus – and receive three hours of training: one of dance, one of singing, and one of acting. There are also adult acting classes on offer. At its newly opened branch in Dollis Hill, 360 Arts offers three hours of triple-threat training for those aged seven to 11 at St Mary and St Andrew’s Church Hall on Saturday mornings. At both locations, the first week is offered as a free taster session. 360 Arts is particularly proud of the diversity of its students, and is determined to do its bit in tackling the problem in the wider industry. Wherever they are taught and wherever they are from, 360 Arts students are made to feel part of a family, with their own uniform – a hoodie and t-shirt – and a special folder to carry around their lyrics and scripts in. It’s not all about the top-class training, though: 360 Arts students also get the opportunity to show off their skills in public. In recent months, they have performed live at London Stadium with Britain’s Got Talent winner Tokio Myers, at the Clayton Crown Hotel in support of Great Ormond Street Children’s Hospital, and at festivals in Cricklewood, Mill Hill, Wembley, Harrow and beyond. 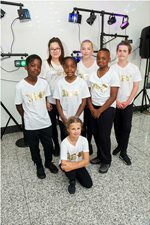 Students also competed in the British Red Cross’ annual charity dance competition Dance Make Your Move, winning a special commendation for best individual choreography. In 2019, they are aiming further afield, hoping to clinch a prestigious performance spot at Disneyland Paris in October. One thing’s for sure. At 360 Arts, students are offered an opportunity like no other.